WANTAGE — In Deb Puskas' kindergarten classroom at the Clifton E. Lawrence School, 19 children entered from the hallway and hung up their coats. Awaiting their arrival was a sleek white VGo robot controlled by student Anthony Longo, a 6-year-old who was diagnosed with acute lymphoblastic leukemia in January. “Anthony's here and he's ready to do center time with you,” Puskas said to the class. The students gathered around the robot, which is outfitted with a moveable camera, wheels and a screen displaying Anthony. “Hi, Anthony,” piped 5-year-old Jenna Osterhoudt, a small blonde girl in pink glasses. According to Puskas, the robot is controlled from home by Anthony via an iPad. As center time (a half-hour of free play that reinforces educational subjects) started, Anthony played a game with two other children at a table. 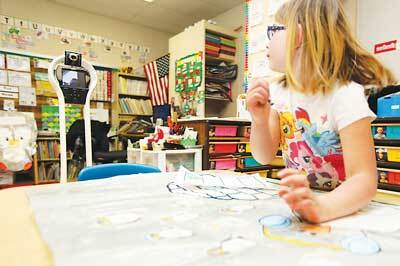 Principal William Kochis said the school received the VGo through a grant from the Valerie Fund Children's Center at Morristown Medical Center. The VGo will be at the school until the end of the school year. “He's still a part of our school, and he's still a part of our family,” Kochis said of Anthony. Anthony's grandfather Scott Sargent, 58, of Wantage, vividly remembers when the family found out Anthony was sick. On Jan. 18, the weather was icy and Anthony, who lives with his grandparents, woke up with a 104-degree fever. He was driven to Newton Medical Center's emergency room, but sent to Goryeb Children's Hospital in Morristown when he developed sepsis, a “potentially life-threatening complication of infection,” according to the Mayo Clinic. “Doctors told us that something had made his immune system not respond correctly,” Sargent said. It wasn't long before he was diagnosed with leukemia. Anthony's other grandfather, Bob Longo, of Denton, Md., was at a movie when he heard the news his grandson was sick. But as Longo soon learned, the world is full of compassionate people, and his grandson, he said, is a strong boy. He was met with support from his coworkers and the local community in Bridgeville, Del., where he works as the chief of police. “It is just incredible the amount of support that has come from people in Delaware, Maryland and New Jersey,” he said. An avenue of support comes directly from the Sussex-Wantage Regional School District. For five hours every week, Puskas visits Anthony's household to ensure the boy is up-to-date with his lessons. “It's more than five hours. She goes above and beyond,” Sargent said. Anthony is in the midst of a 19-week treatment for his disease, Sargent said. Every Wednesday, he goes to Morristown, where he has blood work done, and every three weeks he goes in for three days of chemotherapy. Anthony celebrated his sixth birthday April 19. Since the diagnosis, Sargent said his grandson has gone from watching SpongeBob SquarePants to Discovery Health. “But it keeps him involved on a social level,” he said.